Tropical Cyclone Owen crossed over Queensland Australia’s Cape York Peninsula over the weekend of Dec. 15 and 16 and emerged into the Coral Sea off of Queensland’s southeastern coast. NASA’s Terra satellite provided an infrared image of the remnants and found two very small areas of strong thunderstorms. The Moderate Resolution Imaging Spectroradiometer or MODIS instrument aboard NASA’s Terra satellite captured an infrared image of the remnants of Tropical Cyclone Owen on Dec. 17 at 7:35 a.m. EST (1235 UTC). The image revealed a very small patch of strong thunderstorms where cloud top temperatures were as cold as minus 63 degrees Fahrenheit (minus 53 Celsius). Infrared data provides temperature information. That small patch of strongest thunderstorms had cloud top temperatures as cold as minus 63 degrees Fahrenheit (minus 53 Celsius). NASA research has shown that cloud tops with temperatures that cold were high in the troposphere and have the ability to generate heavy rain. Owen’s remnants are expected to dissipate within a day or two. 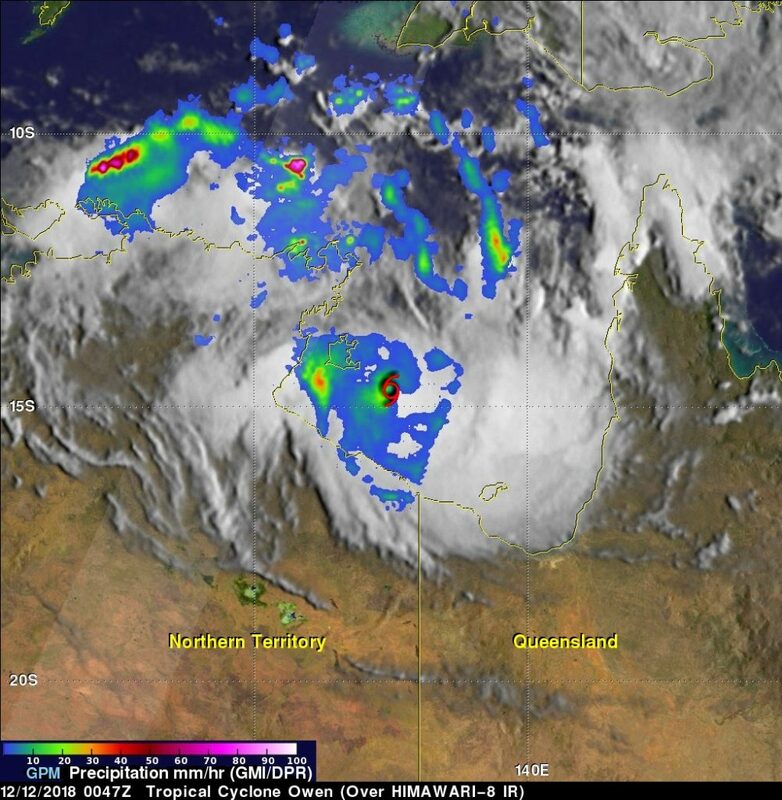 Tropical Cyclone Owen continued to strengthen as it moved east through the Gulf of Carpentaria and toward a landfall in western Queensland, Australia. NASA-NOAA’s Suomi NPP satellite provided a visible image of the storm. On Dec. 14, the Australian Bureau of Meteorology or ABM posted a warning zone that includes coastal and adjacent inland areas between Karumba and Cape Keerweer, including Kowanyama, Pormpuraaw, Croydon and Palmerville. Suomi NPP passed over Owen on Dec. 14 at 4:42 UTC (Dec. 13 at 11:42 p.m. EDT) the Visible Infrared Imaging Radiometer Suite (VIIRS) instrument provided a visible image. VIIRS showed the center was surrounded by powerful storms. Clouds and storms from Owen’s eastern side stretched over Queensland. At 10 p.m. AEST (local time, Queensland) or 7 a.m. EST, Owen was a Category 3 storm with maximum sustained winds near the center of 120 kilometers (75 miles) per hour. It was located near 15.3 degrees south and 140.6 degrees east, estimated to be 120 kilometers west southwest of Pormpuraaw and 160 kilometers (99 miles) north northwest of Gilbert River Mouth. Owen is moving east at 31 kph (19 mph). 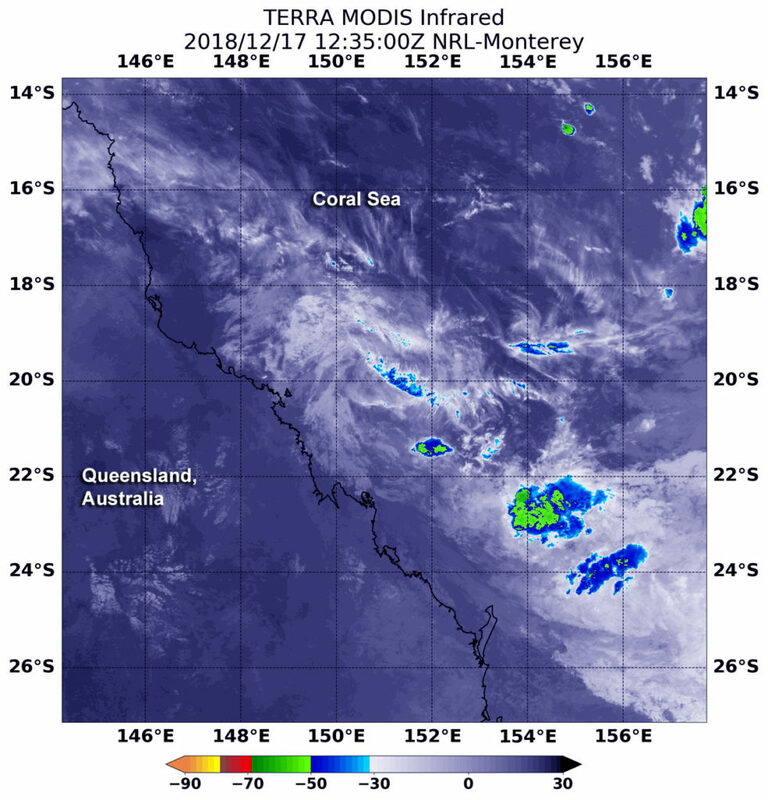 As expected, tropical cyclone Owen recently intensified as it moved over the Gulf of Carpentaria and NASA and the Japan Aerospace Exploration Agency’s GPM core satellite found very heavy rainfall occurring within the revived storm. The storm has made a U-turn in the Gulf and is now headed back to Queensland. The Gulf of Carpentaria is located between Queensland and Northern Territory, Australia. On December 12, 2018 at 0047 UTC (Dec. 11 at 7:47 p.m. EST) Owen’s maximum sustained winds had increased to about 55 knots (63 mph) when the Global Precipitation Measurement mission or GPM core observatory satellite scanned the western side of the tropical cyclone. This wind speed meant that Owen’s intensity had reached the equivalent of a strong tropical storm on the Saffir-Simpson hurricane wind scale. Sea well to the northwest of Owen’s center of circulation. GPM’s GMI indicated that rain in that area was falling at a rate of over 97 mm (3.8 inches) per hour. West of Owen’s center, rainfall was occurring at a rate as high as 40 mm (1.5 inches) per hour. At NASA’s Goddard Space Flight Center in Greenbelt, Maryland, a 3-D view was created using GPM data. 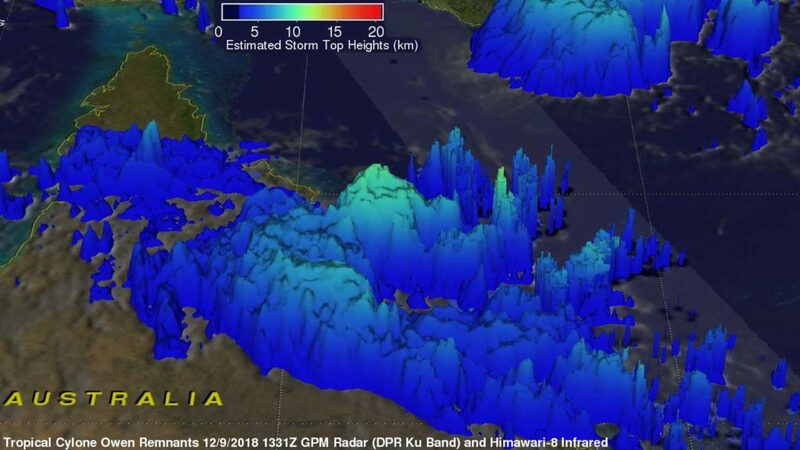 The 3-D view was created using data from the GPM satellite’s Radar (DPR Ku Band) and showed the precipitation structure in storms north of Australia’s Northern Territory. Those powerful convective storms in the Arafura Sea were found by DPR to reach extraordinary heights above 17 km (10.54 miles). The extremely heavy downpours in those storms were returning radar reflectivity values higher than 60 dBZ to the GPM satellite. On Dec. 13, the Australian Bureau of Meteorology or ABM noted that “Severe Tropical Cyclone Owen has started moving eastwards back over the Gulf of Carpentaria and will continue to strengthen as it moves east.” Warnings have been dropped from Port Roper to Port McArthur now that the storm has turned back toward the east. Eastern Northern Territory and western Queensland now have all the warning and watches. ABM said the Warning Zone includes Port McArthur in the Northern Territory, to Aurukun in Queensland, including Mornington Island, Karumba, Kowanyama and Pormpuraaw. The Watch Zone extends inland from Karumba to Aurukun as far as Georgetown, Chillagoe and Coen, Queensland. On Dec. 13 at 9:30 p.m. ACST local time (6:30 a.m. EST) ABM noted that Owen was considered locally as a category 3 storm (a Category 1 hurricane on the Saffir-Simpson Hurricane Wind Scale) with maximum sustained winds near the center at 87 mph (140 kilometers) per hour. Owen was centered near 15.1 degrees south latitude and 136.9 degrees east longitude, about 53 mph (85 km) northeast of Port McArthur and is moving east. 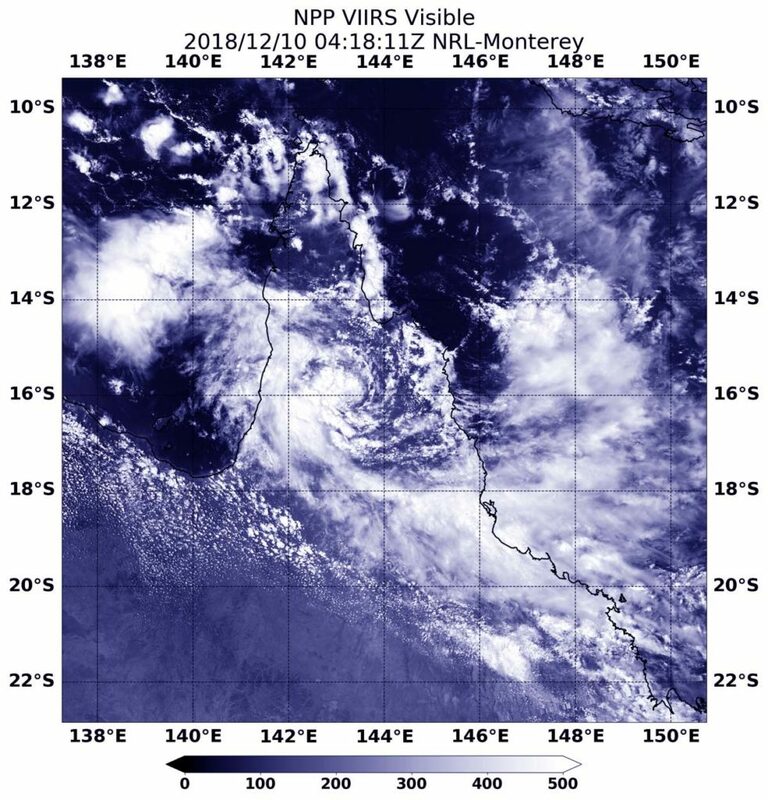 ABM said “Owen is likely to continue to develop further over the next 24 hours as it continues to move east into the central Gulf of Carpentaria and through a more favorable environment. Severe Tropical Cyclone Owen may reach Category 4 intensity early Friday. A coastal crossing along the southeast Gulf of Carpentaria coast between Gilbert River Mouth to Pormpuraaw later Friday or early Saturday is likely, and there is a chance it crosses the coast as a category 4 system. The ABM forecast calls for Owen to make landfall along the southeast Gulf of Carpentaria coast between Gilbert River Mouth to Pormpuraaw later Friday [Dec. 14] or early Saturday [Dec. 15], western Queensland, Australia. An infrared look by NASA’s Aqua satellite found intense storms around the center of the recently revived Tropical Cyclone Owen. On Dec. 12 at 0429 UTC, AIRS found cloud top temperatures of strongest thunderstorms in several area around the center. Those temperatures were as cold as or colder than minus 80 degrees Fahrenheit (minus 62.2 degrees Celsius). They were embedded in a large area where cloud top temperatures were as cold as or colder than minus 70 degrees Fahrenheit (minus 56.6 degrees Celsius). Cloud top temperatures that cold indicate strong storms that have the capability to create heavy rain. On Dec. 12, Tropical Cyclone Owen was intensifying in Australia’s Gulf of Carpentaria, south of Groote Eylandt. Owen is expected to move slowly overnight and be close to the Northern Territory coast and destructive winds are possible along the coast. The Australian Bureau of Meteorology or ABM posted warnings and watches. The Warning Zone includes Alyangula in the Northern Territory, to Burketown in Queensland, including Groote Eylandt, Borroloola, Mornington Island. The Watch Zone includes Burketown to Aurukun and adjacent inland areas including Pormpuraaw, Kowanyama and Karumba. 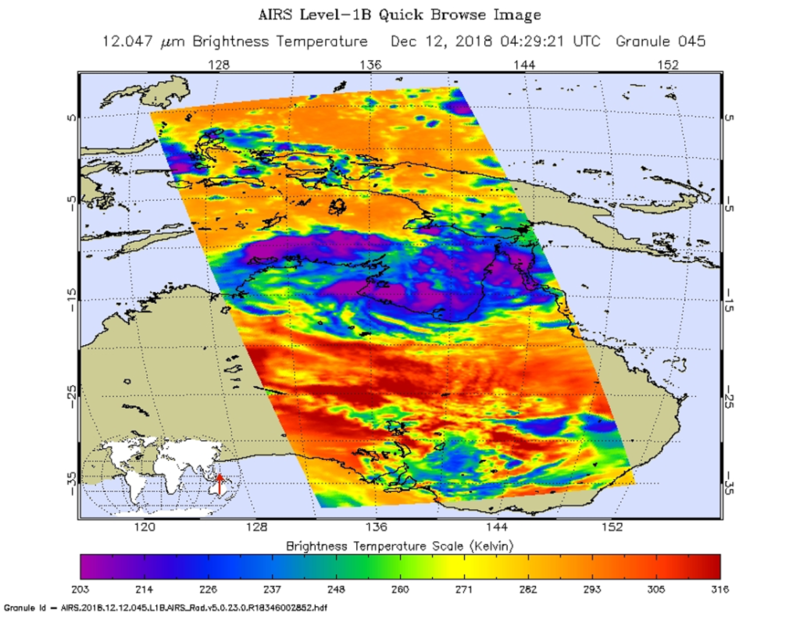 On Dec. 12 at 0429 UTC (Dec. 11 at 11:29 p.m. EST) the Atmospheric Infrared Sounder or AIRS instrument aboard NASA’s Aqua satellite analyzed cloud top temperatures in infrared light. AIRS found cloud top temperatures of strongest thunderstorms in several area around the center. Those temperatures were as cold as or colder than minus 80 degrees Fahrenheit (minus 62.2 degrees Celsius). They were embedded in a large area where cloud top temperatures were as cold as or colder than minus 70 degrees Fahrenheit (minus 56.6 degrees Celsius). Cloud top temperatures that cold indicate strong storms that have the capability to create heavy rain. At 12:30 a.m. ACST local time on Dec. 13 in Queensland (10 a.m. EST, Dec. 12), Owen had sustained winds near 110 kilometers (68 miles) per hour. It was centered near 15.0 degrees South and 136.4 degrees East. That’s about 105 kilometers (71 miles) south of Groote Eylandt. 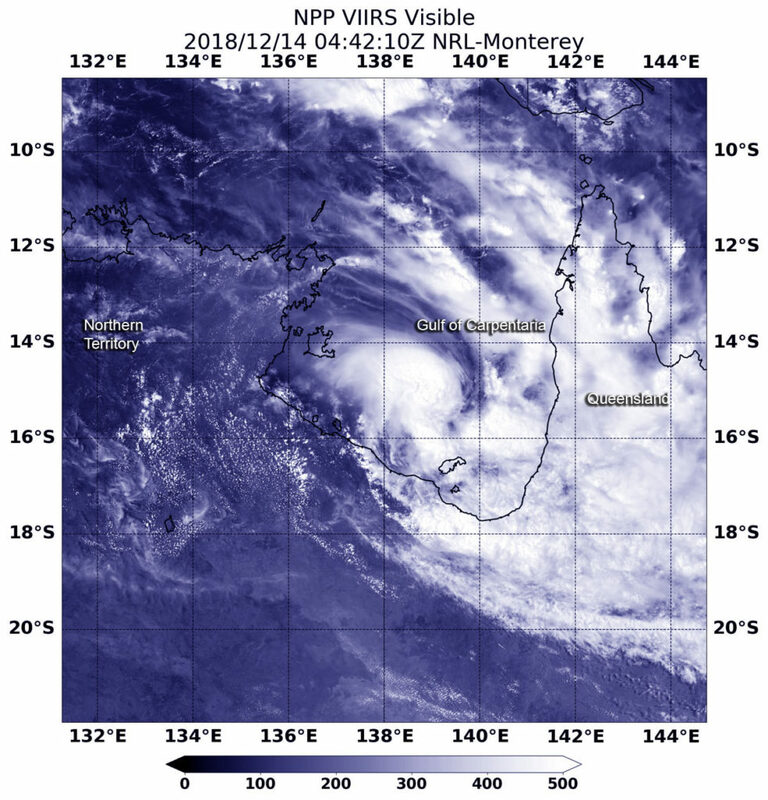 The low pressure area formerly known as Tropical Cyclone Owen continued to organize and cross the southern Gulf of Carpentaria, Australia on Dec. 11. The Global Precipitation Measurement mission or GPM core satellite provided a look at the rainfall rates within the system. On Dec. 11, Australian warnings were posted as Owen continued to consolidate in the Gulf of Carpentaria. A tropical cyclone watch is in force from Cape Shield Northern Territory to Burketown Queensland, including Mornington Island and Groote Eylandt. But it was one week before that Tropical cyclone Owen weakened and was downgraded to a tropical low on December 4, 2018. The tropical low pressure area, also called 05P revived and became a little better organized before it hit the Queensland coast on Dec. 9. Winds in the cyclone had increased to about 35 knots (40 mph) as it moved ashore. The disturbance is expected to intensify again as it moves westward over the warm waters of the Gulf of Carpentaria. Lower vertical wind shear is also predicted to contribute to a more favorable environment for the low’s intensification into a significant tropical cyclone. The GPM core observatory satellite passed above Tropical Cyclone Owen’s remnants as they approached Australia’s coast on December 9, 2018 at 11:31 p.m. AEST (8:31 a.m. EST/1331 UTC). GPM’s Microwave Imager (GMI) and GPM’s Dual-Frequency Precipitation Radar (DPR) instruments collected data that showed the intensity of rainfall in the low’s convective storms. GMI indicated that rain was falling at a rate of over 32.4 mm (1.3 inches) per hour over northeastern Queensland’s coastline. GPM’s DPR revealed that rain was falling at a rate of greater than 52 mm (2 inches) in feeder bands in the Coral Sea off Australia’s coast. A 3-D view was created at NASA’s Goddard Space Flight Center in Greenbelt, Maryland that was derived from GPM’s radar data (DPR Ku Band). It showed the 3-D structure of precipitation within the remnants of tropical cyclone Owen. A simulated flyby of Owen’s remnants, also created at NASA, showed that feeder bands on the eastern side of tropical cyclone Owen’s remnants contained a few storms that reached heights of 13 km (8.1 miles). GPM is a joint mission between NASA and the Japan Aerospace Exploration Agency, JAXA. On Dec. 11, Owen was located in the southern part of the Gulf of Carpentaria and tracking to the west-northwest. The Australian Bureau of Meteorology or ABM noted that Owen was a Category 1 storm with maximum sustained winds near the center of 75 kilometers (46 miles) per hour. That means that Owen has regained its status as a tropical cyclone. Owen was located near 14.9 degrees south latitude and 138.8 degrees east longitude, about 200 kilometers (124 miles) north-northwest of Mornington Island and 300 kilometers (186 miles) east northeast of Borroloola. Owen was moving to the west-northwest. Owen is expected to continue moving slowly to the west for a day, then change course to move eastward and back towards the Queensland coast on Thursday Dec. 13. ABM noted that Owen may reach category 3 intensity by Thursday if conditions remain favorable. A coastal crossing along the southeast Gulf of Carpentaria coast during Friday, Dec. 14 is most likely. Early on Dec. 4 the Visible Infrared Imaging Radiometer Suite (VIIRS) instrument aboard NASA-NOAA’s Suomi NPP satellite analyzed Owen, and showed a disorganized storm with little thunderstorm development. The bulk of the clouds and showers were pushed east of the center of circulation from wind shear. On Dec. 4 at 10 a.m. EDT (1500 UTC) Owen’s maximum sustained winds had dropped to 34.5 mph (30 knots/55.5 kph). It was located approximately 519 nautical miles east of Cairns, Australia. Owen was moving westward. 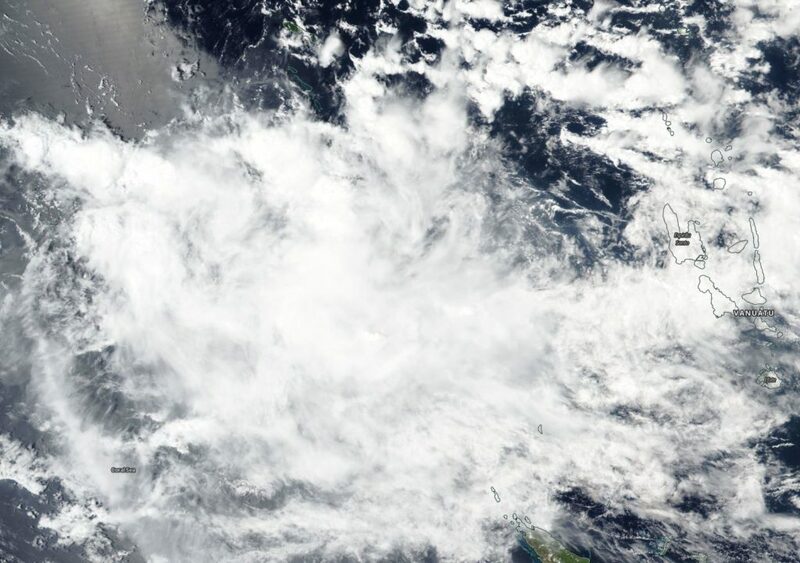 Tropical Cyclone Owen formed in the Southern Pacific Ocean’s Coral Sea southwest of the Solomon Islands when the GPM core observatory satellite passed above and analyzed its rainfall. 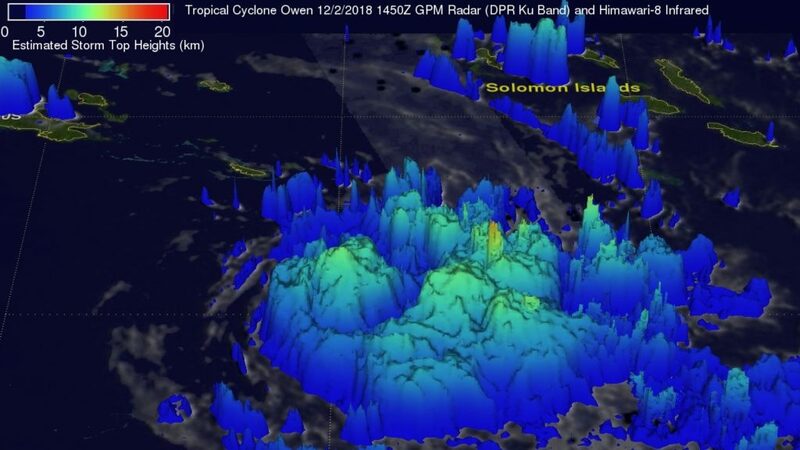 On December 2, 2018 at 9:50 a.m. EST (1450 UTC) data collected by GPM’s Microwave Imager (GMI) and GPM’s Dual-Frequency Precipitation Radar (DPR) instruments aboard the Global Precipitation Measuring Mission or GPM core satellite showed that tropical cyclone Owen was producing heavy downpours. GPM’s GMI indicated that heaviest rainfall was occurring near the low level center of circulation and in feeder bands that were wrapping around Owen’s eastern side. GPM’s GMI provided the best coverage of rainfall in the center of the tropical cyclone. GMI showed that storms in that area were dropping rain at a rate of over 53 mm (2.1 inches) per hour. GPM’s radar (DPR Ku Band) probed storms on Owen’s eastern side. DPR indicated that a few of these intense storms, far from Owen’s center, were dropping rain at a rate of over 94 mm (3.7 inches) per hour. GPM’s radar (DPR Ku band) with heights based on the Himawari-8 satellite’s infrared temperatures.